A couple of days before Grace was born, I pressed the new iteration of my thin panel gluing jig into service gluing up a soundboard for the parlour guitar. 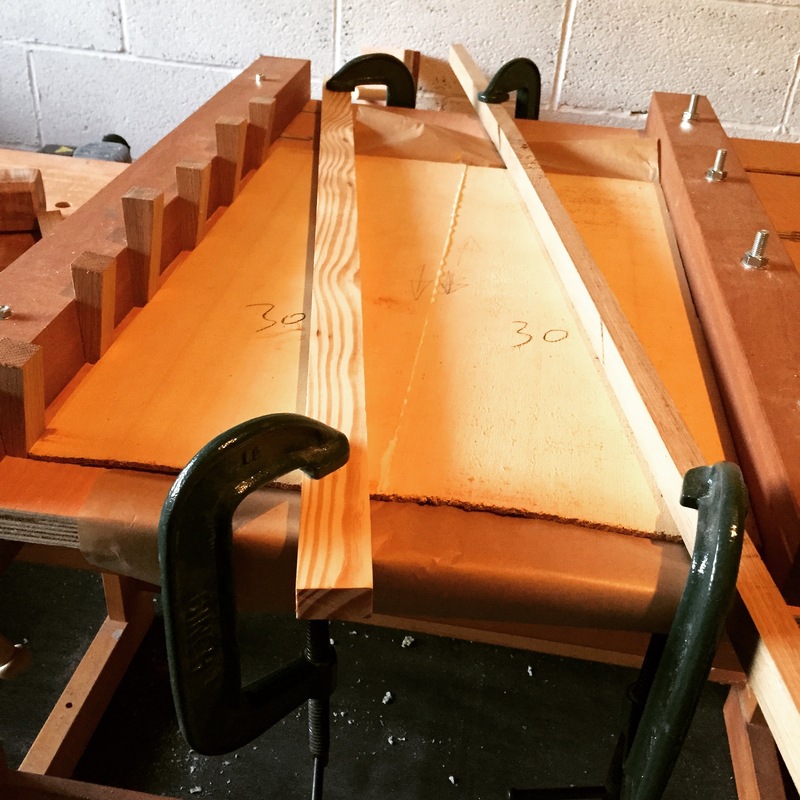 Although I started this guitar build with the neck, I normally prepare the soundboard and back first, and one of the things I love about building acoustic guitars is that very early operations have a decisive effect on the appearance and sound of the final instrument. Preparing the soundboard is one such critical task. When jointing a bookmatched soundboard you have a choice between two edges for the joint, and this choice is critical in how the guitar will ultimately sound. I always joint the plates so that the tight, close grain is at the centre of the soundboard, with the grain becoming wider as you move towards the edge of the instrument. This ensures that the soundboard is as stiff as possible, which in turn allows the bracing to be reduced for a more responsive top (conversely a soundboard which is less stiff will be less able to withstand string tension without heavier braces – acoustic guitar building is a constant balancing of various factors). With the tight grain side of each board identified, my very first step is to take a couple of light swipes with a smoothing or block plane over the face of the board, just over 1 inch or so at the edge to be jointed. This cleans some of the fur off the board and allows me to see the grain properly. I then count the grain bands from the edge until it is possible to identify on both boards where the joint should fall. This is essential for ensuring that the finished soundboard has symmetrical grain radiating outwards from the centreline. I mark the joint position using a fine (0.3mm) mechanical pencil, and then joint each plate. To joint the plates I use a long grain shooting board and a No.8 jointer plane (although I have used a No.5 in the past, and experienced o difficulties in getting a good joint). 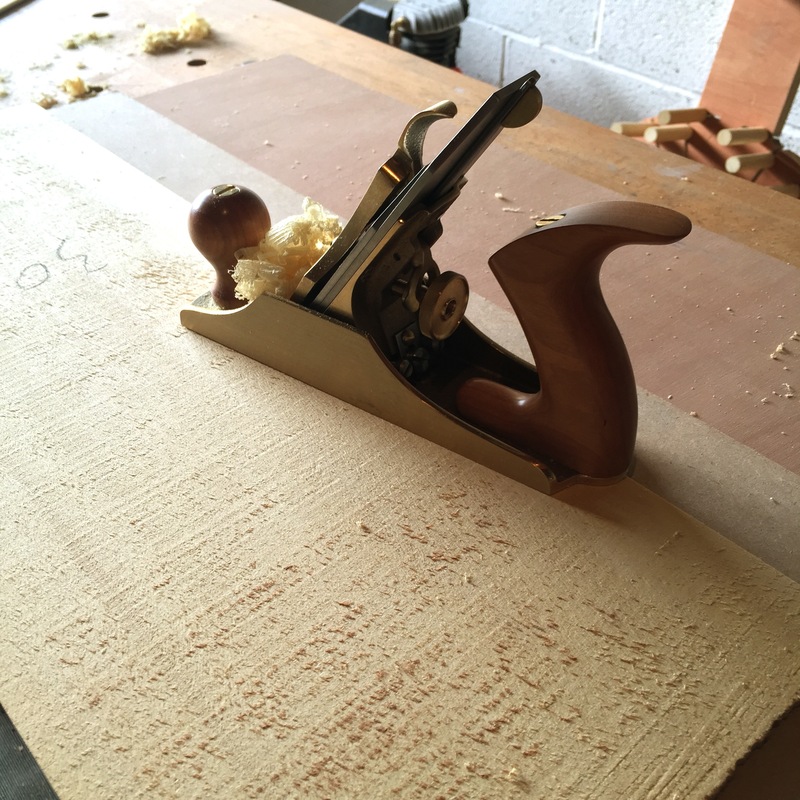 A lot of woodworkers seem to think of long grain shooting boards as being training wheels for the inexperienced, but for thin stock where it is not possible to balance the plane on the edge in a consistent orientation, the long grain shooting board is invaluable. My long grain shooting board is nothing fancy, just a piece of 5mm mdf glued to a wider, 25mm thick plywood base. Because the joint for a soundboard is rarely at 90 degrees to the top edge of the stock I don’t have a full width fence on this shooting board as you would for an end grain shooting board. Instead I have a small piece of marine ply which catches the top left corner of the soundboard, and I hold the stock in position with my left hand. Similarly, the plane does not ride against the edge of the top layer of the shooting board to maintain a straight cut, instead I keep the plane in a straight cut by varying where I place the pressure. My right hand holds the side of the plane, with my forearm on the rear tote. 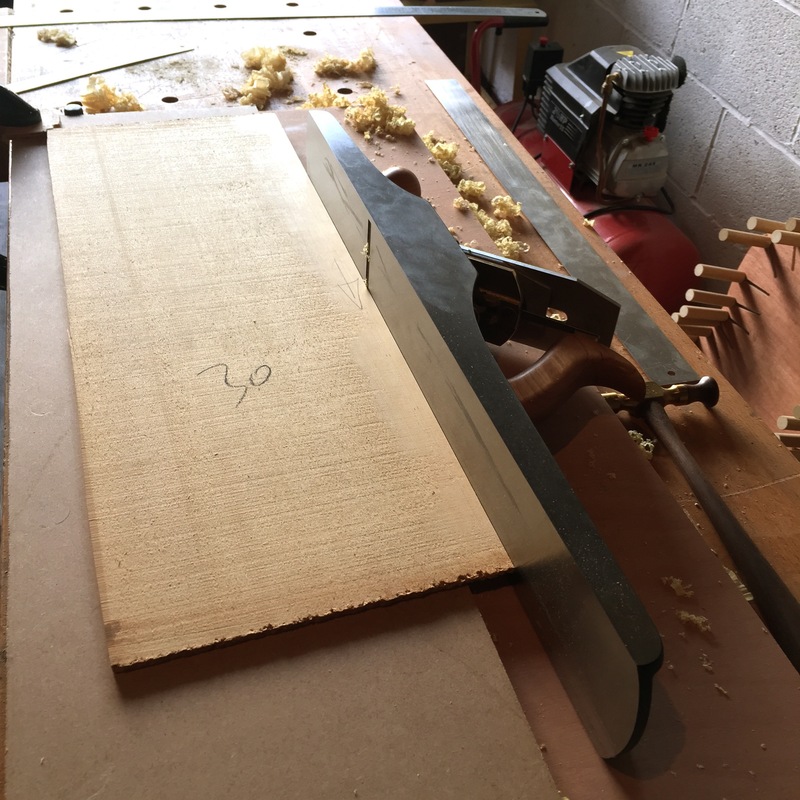 I then attempt to plane a concave curve into the stock (which thanks to the length of the plane, is impossible), pushing in with my hand on the first part of the cut, and then transferring pressure to my forearm on the second half of the cut. With a fine cut, and constantly moving between the two boards, this produces a good solid joint with no gaps pretty quickly (this soundboard took me about 90 minutes from laying out the joint to glue-up). The test for a good joint in thin stock isn’t with the straight edge. Instead, I hold the two boards together and try and rotate them across the joint. If the joint is tight then it will lock in place under minimal hand pressure and the plates won’t slip, nor will any light show through. If more work is needed then the plates will not “lock together” and will constantly slip off each other. With a nice tight joint established, both plates are placed face down in the gluing jig on top of a sheet of grease proof paper (to avoid sticking the plates to the jig), and the moveable beam is adjusted so that there is roughly 10mm of space between the fixed beam and the edge of the plate. Glue is applied to both sides of the joint (I use Titebond Original) and a rub joint used to achieve the initial adhesion. The wedges are then hammered into the slots between the plates and the fixed beam of the jig. Finally, a piece of scrap is clamped on top of each plate to prevent the plates from springing out of the jig under pressure from the wedges. The soundboard was then left in the jig overnight to cure. This entry was posted in Lutherie, parlour guitar by overthewireless. Bookmark the permalink. Great walk through. Great jig too! Do you think it would be possible to make this jig such that it fit in a go-bar deck or would that produce uneven downward pressure? That is an interesting question! I think realistically it would be a case of upscaling your go-bar deck to accommodate the gluing jig. For instance, my go bar deck is 2′ square, but the gluing jig is 3′ square because of the sized stock I generally use for soundboards. I suppose the one concern I would have is that there would be areas of a soundboard which would be unsupported, because the go bars could be clamping directly over one of the slots in the gluing jig deck. I’d be interested to know what benefits you can see for placing this jig on the go bar deck – maybe I’ve been missing a trick! Thanks as always for the interest and thought provoking questions! I suppose I was more or less thinking out loud with that question. The two stability bars you clamp on here are an elegant solution to keep very thing planar. I had just hoisted my go-bar deck back onto my work table before I read this and that lead me to think about parallel uses for the jig and ways to integrate all of my jigs. My deck is the same size as yours (and I would venture to say a great many others) and I have no desire to build another at this point, but I am likely to build this jig. I’m glad the gluing jig appeals to you, Jim. And I’d love to hear your experiences once you’ve built it. I’ve used it for gluing up book matched headstock veneers as well as soundboards, so it is more versatile than you’d first expect. I only have 3 jigs in my workshop (the solera, go bar deck, and gluing jig) and find that I get by just fine with these, so more time to focus on building real things. Looks like I’m building a long-grain shooter today! And I can’t believe you count the growth rings on such tight grain. I understand why its imperative for instruments, but I haven’t tried it yet when bookmatching drawers. Great post! Thanks Brian! Counting growth rings on a straight grained soundboard is fine, when it gets really fun is doing the same for a quilted maple back! What will you be using your long grain shooter for? I want to make one to deal with thin stock, per your insight. Although I never thought of it before, I hate jointing thin cherry, mahogony, poplar, and maple — all of which I like to use regularly for tray dividers, drawer bottoms, and jewelry boxes.